The fourth entry in The Fast and the Furious franchise tries to inject a nitro of interest by bringing together the original cast members for another round of street racing in customised imports and American muscle cars. After the forgettable 2 Fast 2 Furious and The Fast and the Furious: Tokyo Drift, the series needed a fresh paintjob to attract any attention, but the return of Vin Diesel, Paul Walker, Michelle Rodriguez and Jordana Brewster alone may reunite the first movie’s stars, however coupled with a generic story of revenge tacked on to a few high octane chases around city street, their lack of on-screen chemistry struggles to get Fast & Furious out of first gear. 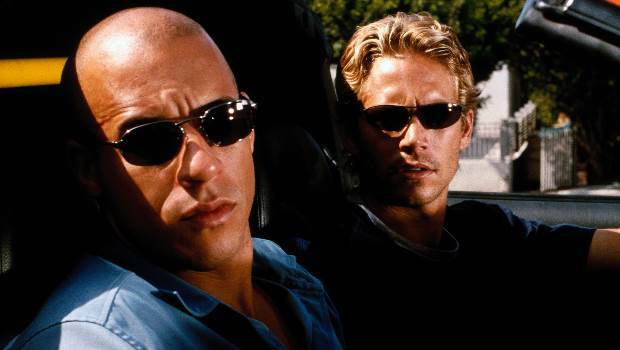 The last time we saw hard man Dom Toretto (Diesel) he was driving off into the distance after F.B.I. agent Brian O’Conner (Walker) let him go. Now he’s committed himself to a fugitive existence, hijacking fuel tankers in the Dominican Republic with the sole remnant of his past, girlfriend Letty (Rodriguez). Cue an elaborate highway robbery of an oil tanker in motion and the inevitable truck crashing over a mountain road barrier in a ball of flames. So far, so fast and furious. Deciding to take a break from being on the wrong side of the law, Toretto is forced to face a few demons when Letty is killed while he is in a self-induced exile, and heads back to L.A. seeking revenge. There he must race his way back into a gangster’s good books in a bid to track down the killer, a man wanted by O’Conner too for both personal and professional reasons. They begrudgingly team up picking up Dom’s sister Mia (Brewster) on the way though this has all the hallmarks of cast and crew going on auto pilot just to reach the finish line rather than pulling off any daring stunts on the way. There are stunts, of course, though there are only so many times the sight of a car crashing and spinning a hair’s breadth away from another is exciting. This series has repeated the same trick numerous times, and we’ve seen Toretto total his American muscle car before, we don’t need to see it twice more here. Nor do we really need to see Diesel and Walker attempt to act out an awkward buddy/enemy friendship: their pairing has all the charisma of a barn chatting to a shed. The girls are hardly needed, with Rodriguez effectively in a cameo and Brewster there to look nice and say little. The plot provides an excuse for a foray to Mexico, but the numerous street races featuring Japanese cars with over-elaborate body parts and paint jobs inducing nitros at the right or wrong times: have been replaced by more generic one car after another chases. The eye candy of seeing cars you wish you could drive either power sliding round corners or getting smashed up are few and far between, losing much of the appeal for petrol-heads. Fast & Furious suggests there was little new tarmac to cover with the franchise and the reappearance of Diesel, Walker, Rodriguez and Brewster is a double-edged sword as they may be the main draw for fans of the first film, but they’re as exciting to watch as a Robin Reliant drag race.